Use plenty of water, both in your washes and to drink! Make the most of those lovely cast shadows, and they will be at their best at 7 am! The Patchings Art festival takes place from Thursday 12th to Sunday 15th, and we will be there on the first three days. I shall be demonstrating in the St Cuthberts Mill marquee on their marvellous Saunders Waterford paper. We also have a stand in the art materials marquee, so do come along and have a chat. The festival is incredibly popular and is just about the best day out in the country for the aspiring artist. I have just dropped a number of paintings in to the Ardent Gallery in the High Street, Brecon. If you are in the area do pop in and have a look around as they have some lovely work on display. Their telephone number is 01874 623333. 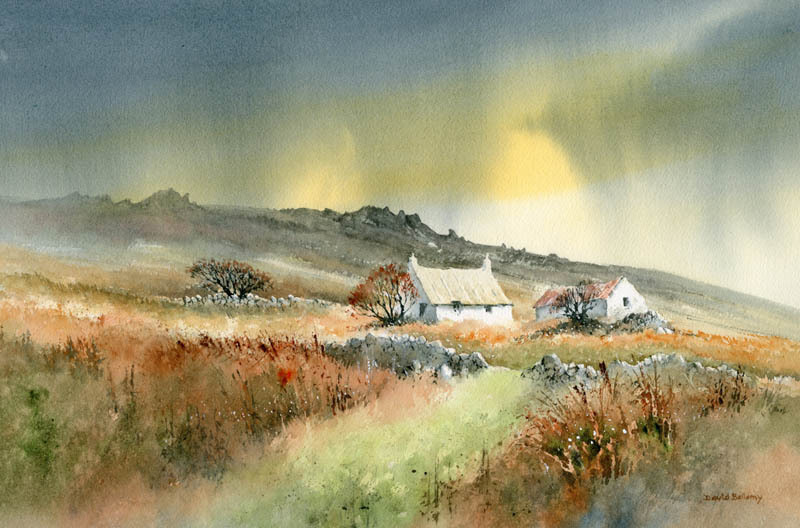 The watercolour of Cottage on Mynydd Dinas (see below) is one on display. The brooding sky and background moorland ridge throws the emphasis firmly onto the sunlight cottage forming the centre of interest. Note how I have slightly darkened the lower part of the cottage roof in order to make it stand out against the stark white of the front wall. Sadly, there are not many of these traditional old Pembrokeshire cottages remaining now. We are taking a group of painters to Ronda in Spain during September, and the painting holiday booked up very quickly. Unfortunately two people have had to drop out because of illness, so if you fancy coming along you will be very welcome. Details of the painting holiday are at http://www.davidbellamy.co.uk/painting-holiday-to-andalucia-september-2018/ It is organised by West Norfolk Arts who do a really superb job of organising these holidays for us, and they appear to know every shady spot around the Mediterranean! This entry was posted in David Bellamy, painting holiday, sketch, sketching, sketching outdoors, Sketching travel, Skies in Watercolour and tagged Saunders Waterford, sketching, watercolour sketches by David Bellamy. Bookmark the permalink. Have a great trip to Spain, David. West Norfolk Arts was where I had my first watercolour course many years ago – lovely venue and people! How nice to get your painting, will bear all details in mind on my next painting. How I would really enjoy your next planned painting in Ronda. Unfortunately, my current back and hip problems have prevented even pottering in the gardens! Very frustrating at this time of year, plus having to sell my car, sensible, but a wise and advised decision! Anyway I Can still paint at home,, with one on the go at theI moment. It is a picture Across the River Severn from my sisters garden to a little Church, where I sold my first painting, at an exhibition !!! the Artbgroup I formed here. In Headley, has proved very popular,just a weekly meeting, and I still paint at home too,very therapeutic! All bestbofbwishes. From Diana Crosser. Thank you for the suggestions! I live in Toledo, Ohio. It’s been very hot and humid, even in the morning. Yikes! Enough about the weather, My husband and I like your painting very much! You hit the colors and light just right. I always enjoy reading your “bivouac”. I am not a morning person, so ulikely to be out painting at 7am, although I always regret this fact when I occasionally happen to be out at that time (like last Thursday driving back from France through a lovely sunrise in the Tewksbury area). I am more of a night owl and likely to be enjoying the no less stunning lights at sunset. Not good at painting outdoors, either, or anywhere else for that matter – never have enough time or space to paint. I will be at Patchiings 0n Friday and Saturday and will surely see you and Jenny. I have my ticket for your demonstration. I visit the Ardent Gallery regularly and am often seen drooling over your paintings. I will try and get there next week to see the new batch of your works. The never-ending current heatwave is very unusual in our parts and I have never seen so little green in the Welsh countryside or so few birds in my garden, leaving their food practically untouched. But I know they are watching, because a few always rush to the various bird baths as soon as I replace the hot water with a fresh cold supply. It is nice, though, to have a real summer and it’s here to be enjoyed. Thanks for early morning suggestion. West Sussex beach is fantastic for sky scenes over the South Downs and a solitary sailor meandering towards Isle of Wight. Judith.